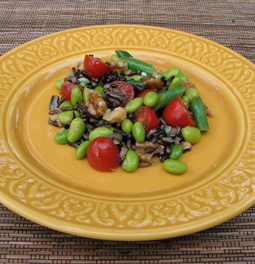 Wild Rice Salad with Edamame, Tomatoes, Green Beans, and Lemon Vinaigrette - A recipe from Savor California, the online showcase for extraordinary gourmet foods and beverages from California. Spread walnuts on a rimmed baking sheet. Toast in oven, tossing once, until fragrant, 8-10 minutes. Let cool; chop. Blanch green beans in boiling salted water for about 1-1/2 minutes. Drain and cool. Whisk lemon juice, vinegar, and sugar in a small bowl. Whisking constantly, gradually drizzle in oil. Season vinaigrette with salt. Crumble cooked rice with your fingers. Toss rice, walnuts, scallions, edamame, tomatoes, and green beans with vinaigrette in a large bowl. Season with salt and pepper.